The High Priestess tarot is one of the most profound cards in the Rider Waite deck. She represents pure spirituality achieved through perfect balance. In the High Priestess tarot card, polar opposites (male/female, action/reaction, etc.) combine thus bringing about the ability to be in complete control of one’s self. 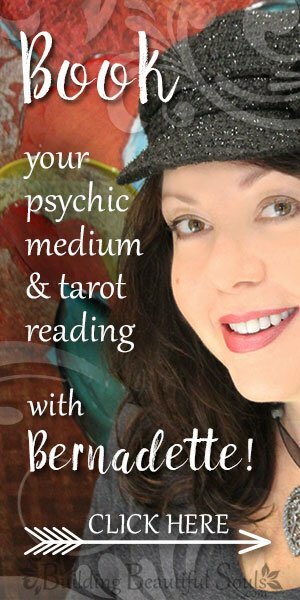 The High Priestess tarot reconciles the right with the left and the above with the below. The 2 pillars on each side of her are called Boaz (severity) and Jachin (mercy). Because The High Priestess sits in the middle of the white (light) and black (dark) she becomes the third pillar. In this, the High Priestess tarot combines equal parts of the 2 and becomes 1. The yellow floor and blue background of the High Priestess tarot card suggest perfect harmony between the rational and intuitive mind. This perfect balance is summed up by the equal armed solar cross, which is also a symbol for divinity. Her crown takes this idea even further by combining the solar disk in the center with the lunar crescents on the sides. As the keeper of intuition The High Priestess knows the rational human mind can’t wrap itself fully around her mysteries. That’s why the scroll on her lap is partially concealed. The moon at the High Priestess’ feet and her blue and white robes, symbolizing purity and spiritual devotion, suggest that exploring our subconscious mind can help us a great deal along the way – leading us to an awareness of the part within us that is divine and eternal. The veil hanging between the pillars on the High Priestess tarot card is embroidered with palms and pomegranates, symbols of immortality. As such, the veil is representative of the gossamer threshold between this world and the next. The High Priestess tarot card symbolizes a deep understanding of spiritual mysteries and the inner calm that comes with it. You accept that the spirituals truths you are encountering are partially beyond comprehension because they are so much larger than you. When The High Priestess card comes to you in a reading, it is a reminder that you can fully trust your intuitions and psychic insights and, further, that you should be paying extra attention to them at this time. The impressions and images you may now receive during meditation are genuine communications from the divine source. This may surprise you at first because after all, the point of meditation is to quiet the mind and free it from the distractions of the outside world – as well as those of your own thoughts and currents of your subconscious mind. You know that the “visions” beginners see during meditation are simply their brains’ synapses firing at random; they’re a bit like waking dreams. But what you are receiving now is coming from a higher source. That is why some of the imagery you are seeing may seem confusing. Your spiritual development has reached a stage at which you are drawn within so you can reflect and process new information have received. This time of reflection is often accompanied by a period of retreating from the world around you. For example, you may find yourself spending more evenings than usual just staying at home reading a good book. Or you may suddenly become less chatty than you usually are, just smiling mysteriously when others speak to you about everyday things. Ironically, this solitude does not feel lonely, at all. You can tell because you are filled with an almost indescribable peace of mind. You also know that this is only a temporary retreat into your personal, inner Bat Cave. When the High Priestess tarot is reversed, you may feel overcome by a sense of isolation, or you may be frustrated by the fact that you are having a difficult time communicating your ideas to others effectively. You have important things to say, but others seem to brush you off, or they stare at you in utter confusion. While you have received important information and you have many relevant things to share with others, you may not have given yourself enough time to reflect on them and sort everything out properly. Or you may be unwilling to accept that some of the insights you have received cannot be perceived with human senses or expressed with human words. In other words, you’re not listening to the Universe – especially if you’re using your command of metaphysics or understanding of the occult in less than honorable ways. No dark magick kiddies, it’s bad juju and no good will come of it. Vivid spiritual experiences often express ideas that the human brain is too inexperienced to compute, and the divine consciousness must use symbols that make sense to us so we can communicate its message. That description certainly compares to what we have seen from NASA footage of rocket launches. However, it is only one of many possible interpretations, and the entire passage may be purely symbolic. It is important to understand that visions which are especially moving are not necessarily meant to be taken at face value. Sometimes it takes years to fully understand them. Sometimes it takes lifetimes. An additional interpretation of The High Priestess card inverted is that you find it difficult to accept that spiritual truth expresses itself differently to different people. Are you trying to impose your opinion of a spiritual vision on others? Do you have a hidden agenda in your interactions? Are you trying to control others by keeping or spreading harmful secrets? If so, The High Priestess tarot card has appeared to you as a reminder to walk in integrity, always. 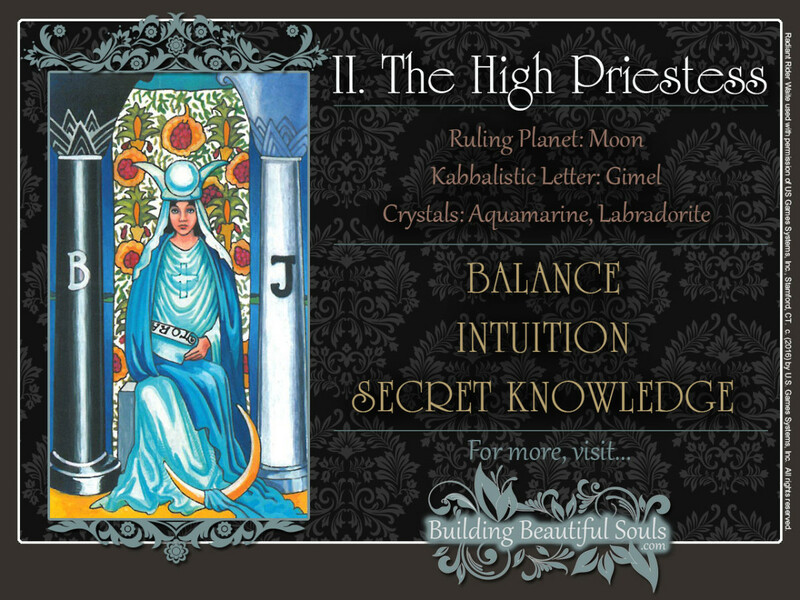 The High Priestess is the second Major Arcanum. In Numerology, the Number 2 is associated with the Moon and the element of water, symbolizing the powerful influence of the subconscious and inspiration. As the Roman numeral “II” illustrates visually, this number also shows a state of perfect balance.